Scientists at the U.S. Department of Energy's Argonne National Laboratory have discovered a way to use a microscopic swirling flow to rapidly clear a circle of tiny bacteria or swimming robots. "This discovery offers a new approach for control and manipulation of microscopic swimmers," said Argonne physicist and co-author Igor Aronson, and it could be useful in tiny microfluidic ("lab-on-a-chip") devices that can quickly run chemical or biological analyses or perform tasks. Normally the bacteria swim randomly; but when scientists spun the particle by applying a rotating magnetic field, the swimmers shot away from the center, like a school of fish that suddenly realized there's a shark in their midst. What's actually happening is that the particle is rotating, creating a small vortex around itself. The bacteria swim parallel to the stream lines and are quickly pushed outward—except for a few that get sucked in right next to the particle. They're not pushed out by centrifugal force, said Argonne scientist Andrey Sokolov, who co-authored the paper; dead bacteria, which aren't swimming, are not pushed out with their living companions. "Because of the curvature of the flow, some swim in and are trapped on the rotating particle, and others are forced to swim out of the curved flow," Sokolov said. This technique could separate live from dead bacteria, or different species, bacterial strains or mutants from one another. "The shape and swimming rates of different species would mean they separate," Aronson said. 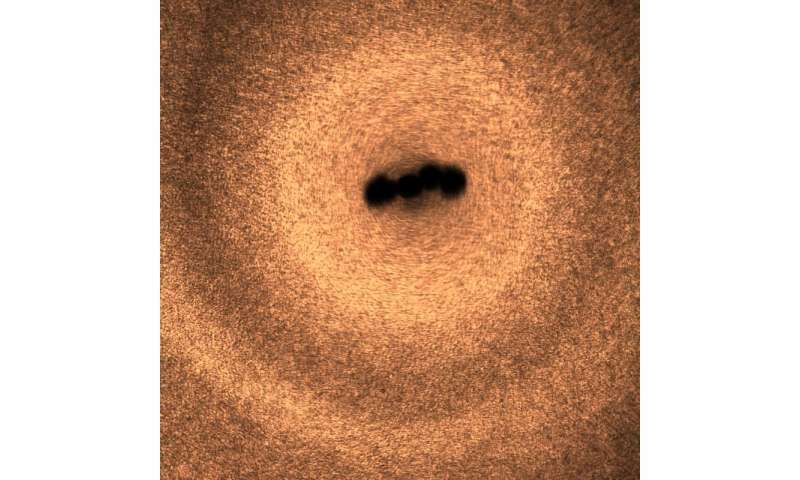 "At certain frequencies of rotation, the bacteria self-organize into a spiral-shaped halo, creating a microscopic galaxy—similar to our galaxy Milky Way, but trillions of trillions (1024) of times smaller," Sokolov said.